In its 33rd meeting held on 24th February'2019, the GST Council announced a major change in the rate structure of real estate sector. 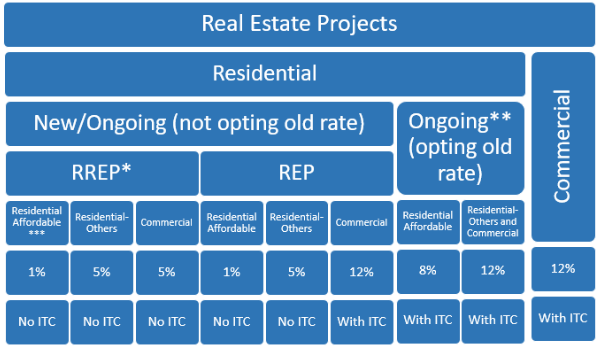 From the earlier rate of 12%/8% (Other Residential /Affordable), the rates were slashed to 5%/1% with the condition that ITC would not be available to the project developers. This change has been made effective from 1st April'2019 and legal notifications (NN 03/2019 to 08/2019 CT(Rate) and NN 16/2019 CT (and respective notifications in SGST/UTGST/IGST)) have been issued for the same which are summarized below. Exemption by way of supplying services of Transfer of Development Rights (TDR), Floor Space Index (FSI), long term lease on or after 1st April'2019 in proportion to total residential apartments in the project. However, on receipt of Completion Certificate (CC) or first occupation, whichever is earlier, tax have to be paid on TDR in proportion to unsold residential apartments on that date. However, such tax payable shall not exceed 5%/1% value of the Other residential/ Affordable residential apartment respectively. Value of TDR in case of supply of apartments against such TDR shall be equal to the value of apartments so given to the landowner. Such tax on TDR/FSI/Lease shall be paid by the developer (promoter) under RCM as the recipient and not the landowner. Time of Supply to pay tax on TDR/FSI/Lease, as well as tax o n s upply of apartments to landowner against such TDR, shall arise at the time of receipt of CC or first occupation, whichever is earlier. *All projects are called REP (Real Estate Projects) as per RERA (Real Estate Regulation and Development Act). RREP (Residential Real Estate Projects) shall mean a REP in which the carpet area of the commercial apartments is not more than 15 percent of the total carpet area of all the apartments in the project. (d) apartments under the project have been, partly or wholly, booked on or before the 31st March, 2019. (a) In terms of size - having carpet area up to 60 square meter in metropolitan cities or 90 square meter in cities other than metropolitan cities. (b) In terms of cost - The gross amount charged is not more than 45 lakhs. Metropolitan cities are Bengaluru, Chennai, Delhi NCR (limited to Delhi, Noida, Greater Noida, Ghaziabad, Gurgaon, Faridabad), Hyderabad, Kolkata and Mumbai (whole of MMR).